NASA's newest Mars rover is entering the final leg of its space cruise, with just over three months remaining until it touches down on the Red Planet. 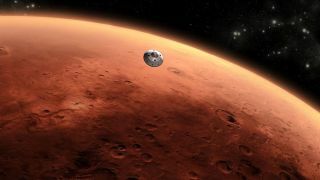 The huge Curiosity rover launched in November and is slated to land at Mars' Gale Crater on the night of Aug. 5. Curiosity's mission team is working hard to prepare for the impending arrival, practicing the rover's unconventional landing and mapping out just what it will do on the Red Planet's surface. "Landing an SUV-sized vehicle next to the side of a mountain 85 million miles from home is always stimulating," said Pete Theisinger, Curiosity project manager at NASA's Jet Propulsion Laboratory in Pasadena, Calif., in a statement. "Our engineering and science teams continue their preparations for that big day and the surface operations to follow." Curiosity is the heart of NASA's $2.5 billion Mars Science Laboratory (MSL) mission. The 1-ton rover's main task is to determine if the Gale Crater area is, or ever was, capable of supporting microbial life, and Curiosity carries 10 different science instruments to help it address this question. Because the rover is so heavy, the mission team had to come up with an entirely new way to land it on Mars. The design researchers settled on is a rocket-powered sky crane, which will lower Curiosity down to the Red Planet on cables, then fly off and crash-land a safe distance away. While this all may sound a little daring and a little sci-fi, the MSL team is confident it will work. "Everybody did their part, and if everybody did their part well, it'll be fine," said Ken Edgett of Malin Space Science Systems in San Diego, principal investigator for Curiosity's Mars Hand Lens Imager instrument, or MAHLI. The landing team is practicing for the events of Aug. 5 over and over again, Edgett added. And other MSL researchers are scouring images of the Gale Crater area from NASA's Mars Reconnaissance Orbiter spacecraft, to better understand the region's weather patterns and get an idea of what conditions may be like on the fateful day. "We try to get pictures of the landing area as often as we can, to document any changes," Edgett told SPACE.com. Meanwhile, he added, other MSL scientists are going through surface readiness tests — practicing how they might operate Curiosity on Mars and working out any bugs that they discover in the rover's systems. MSL's mission is nearly 10 years in the making, and all that hard work should start coming to fruition in a little more than three months. Now that crunch time is upon them, the MSL team may be experiencing a rush of excitement mixed with some anxiety — a feeling many expectant parents are all too familiar with. "It's kind of a mad scramble," Edgett said of the mission's current preparations. "It's like a pregnancy. That baby's coming, whether you're ready or not."